A visitor to London, exploring the Borough of Southwark, and alighting at Elephant and Castle, finds himself or herself at the centre of one of London's busiest road junctions. 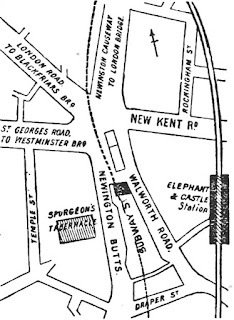 It takes its name, almost certainly, from a coaching inn long since demolished, but owes its existence, as a junction, to improvements made to the roads leading in and out of London in the Eighteenth Century. From Roman times down to the Seventeenth Century, London had only one bridge across the Thames, London Bridge, which, with time, had become increasingly congested. Westminster Bridge opened in 1752, and Blackfriars Bridge in 1769, opening up the City, and the newly developed West End, to increased traffic from the south. 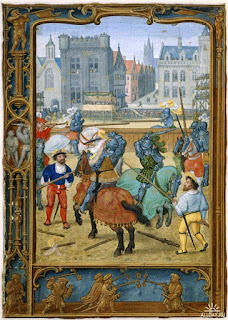 Prior to this, the area around Elephant and Castle was open countryside, "Saint George's Fields," used for military training and pony races. Here it was, in 1780, that the anti-Catholic Gordon Rioters had assembled, before marching on London. Between 1801 and 1841, the population of London increased by an average of 22,500 people per year, or 1875 per month. Most of these people were migrants from the market towns and rural parishes of the British Isles, and many, like the character of Kate in Charles Dickens's Nicholas Nickleby, sought work in the retail industries of the West End, as milliners and shop assistants, bar-tenders, and seamstresses. With rents in the City and the West End soaring, many made their homes on the south side of the river. 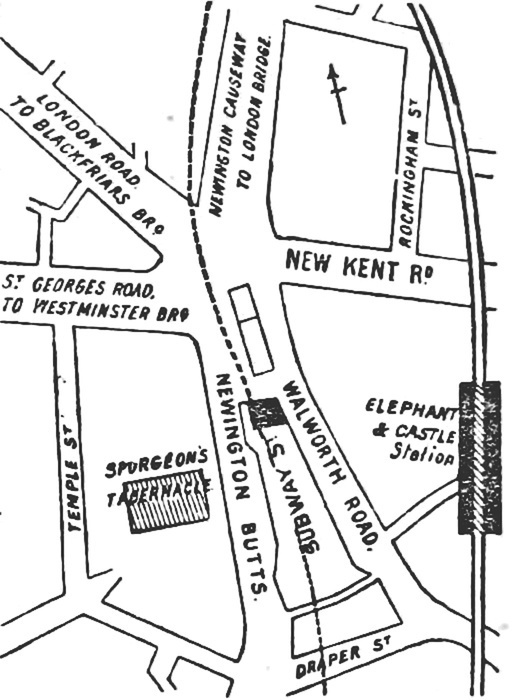 A construction boom was underway in Southwark, and was boosted by the coming of the railways in the middle decades of the Nineteenth Century. Much of the labour for the construction industry was provided by Irish immigrants, driven from their homeland by famine, and the overwhelming majority of these immigrants were Roman Catholics. London had few Catholic churches or priests, the legal restrictions on Catholic worship having been removed just a few decades earlier. 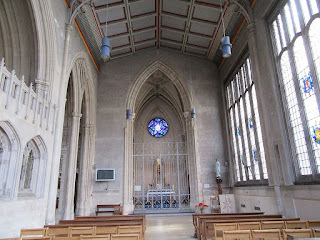 A short walk along Saint George's Road from Elephant and Castle brings our visitor to Saint George's Catholic Cathedral. 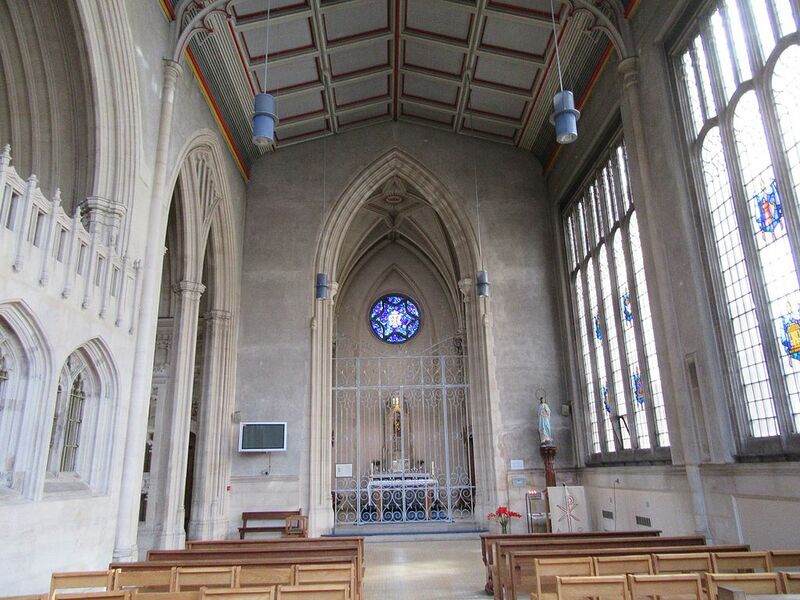 Designed by the Catholic architect, Augustus Pugin, it can hardly be accounted his masterpiece. 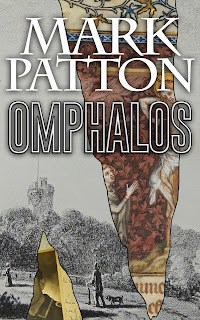 Other commissions, not least that for the Palace of Westminster, gave him much greater latitude to explore his passion for neo-Gothic ornamentation. The budget for Saint George's was limited, and a large church was needed in something of a hurry. It was dedicated by Bishop Wiseman in 1848, and Pugin and his third wife, Jane, were the first couple to be married at the high altar. Four years later, it was raised to the status of a cathedral. Saint George's Cathedral, Southwark. Photo: C. Ford (licensed under CCA). 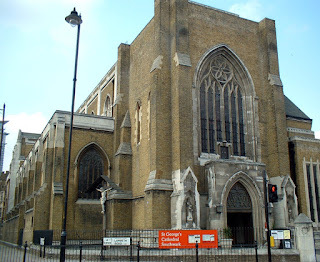 Saint George's Cathedral, Southwark. Photo: Fuyaboo (licensed under CCA). Saint George's Cathedral in 1942, following a bombing raid. Photo: Imperial War Museum, Non-Commercial License D7216. From Saint George's or visitor can cross the road to the building that, today, houses the Imperial War Museum, but which, from 1815 to 1930 was the Royal Bethlem Hospital, relocated from Moorgate. In an age before mental illness was well understood, it offered little more than asylum. Pugin spent time here as a patient, and would have died as such, had Jane not had the courage and initiative to secure his release. 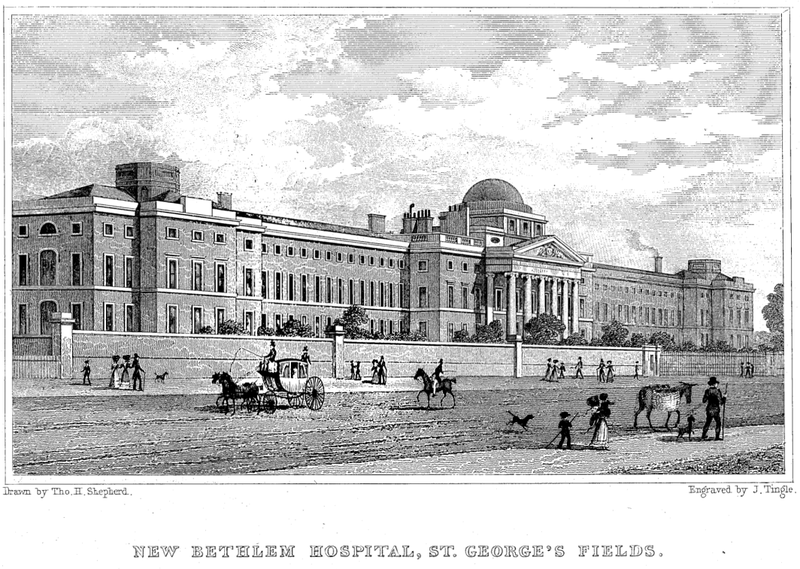 The Royal Bethlem Hopital, 1828 (image is in the Public Domain). 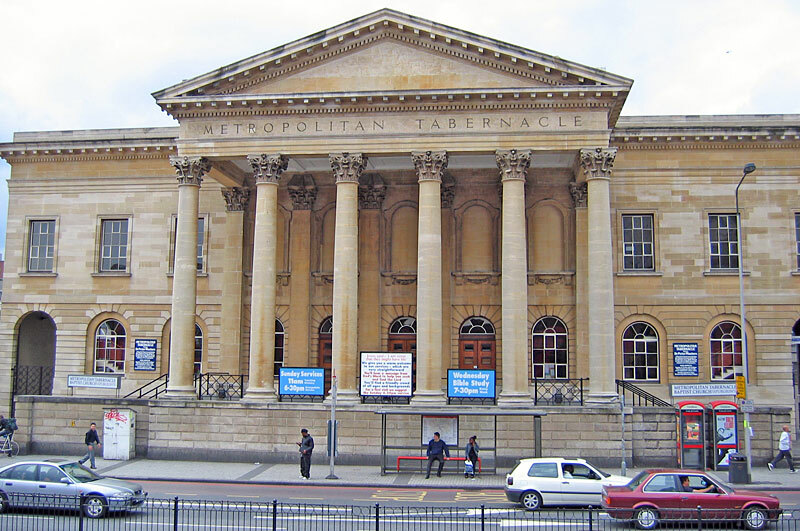 The short walk back to Elephant and Castle along the south side of the road brings us to another symbol of religious revival: the neo-Classical facade (which Pugin would have hated) of the London Metropolitan Tabernacle, opened in 1861. 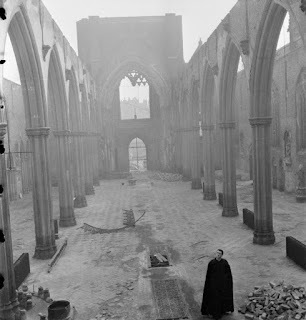 More so than the Catholic Church, the Church of England had struggled to make itself relevant to the deracinated and newly urbanised population of a fast-expanding metropolis. The field was open to charismatic preachers, with a clear and simple message, and few were more charismatic than the Baptist, Charles Haddon Spurgeon, for whom this church was built. 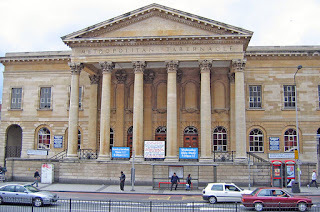 The London Metropolitan Tabernacle. Photo: C. Ford (licensed under CCA). 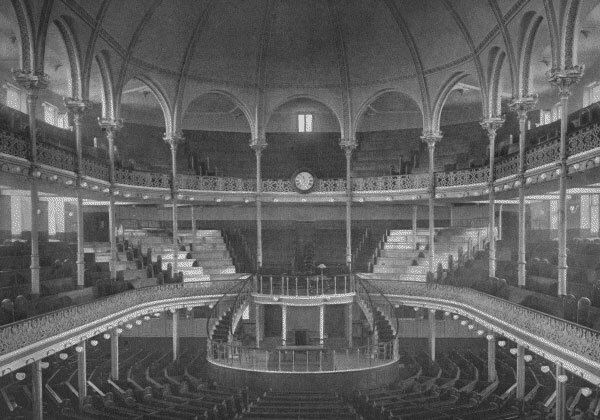 The London Metropolitan Tabernacle in 1864 (image is in the Public Domain). No recordings of Spurgeon's voice exist, but he must have been an unusually powerful orator, since he had preached (without any amplification) to congregations of more than ten thousand people in a variety of venues, including the Crystal Palace. The Tabernacle itself held five thousand people, with standing room for a further thousand, one of the world's first "mega-churches." Stenographers were on hand to transcribe his sermons, which were rapidly circulated around London. Charles Haddon Spurgeon, by Alexander Melville, National Portrait Gallery 2641 (image is in the Public Domain). The "Sword and Trowel," in which Spurgeon's sermons were published (image is in the Public Domain). His message, as set out in his first sermon at the Tabernacle, could not have been more simple. "I would propose that the subject of the ministry of this house, as long as this platform shall stand, and as long as this house shall be frequented by worshipers, shall be the person of Jesus Christ ... who is, himself, all theology, the incarnation of every precious truth, the all-glorious personal embodiment of the way, the truth, and the life." Spurgeon was also a writer of hymns, one of which can be heard here. 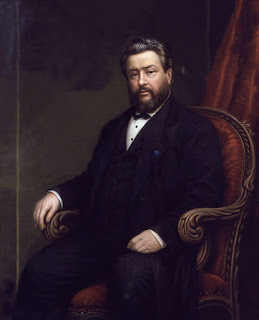 He had little time for the "New Theology" of the Anglican Church, which sought a rapprochement with the scientific discoveries of the age, including Charles Darwin's theory of evolution by means of natural selection: even if "preached for a thousand years by all the most earnest men of the school," Spurgeon insisted, "it would never renew a soul, nor overcome pride in a single human heart." In a city in which the realities of life and death were frequently brutal, however, his simple message of faith, salvation, and the promise of eternal life, was surely of comfort to many. From Elephant and Castle, our visitor may take the Number 35 or 45 bus to Loughborough Junction (actually in the neighbouring Borough of Lambeth), and there change to the P4 bus, alighting at our next destination within Southwark: Dulwich Village. The Elephant and Castle in 1888, British LibraryHMNTS 10350 d.19, from A. Boot and Son, The District Railway Guide to London (image is in the Public Domain). The month of June begins, this year, with the Christian celebration of Pentecost, marking the end of the Easter season. In most years, however, this festival would already have been completed before the end of May. 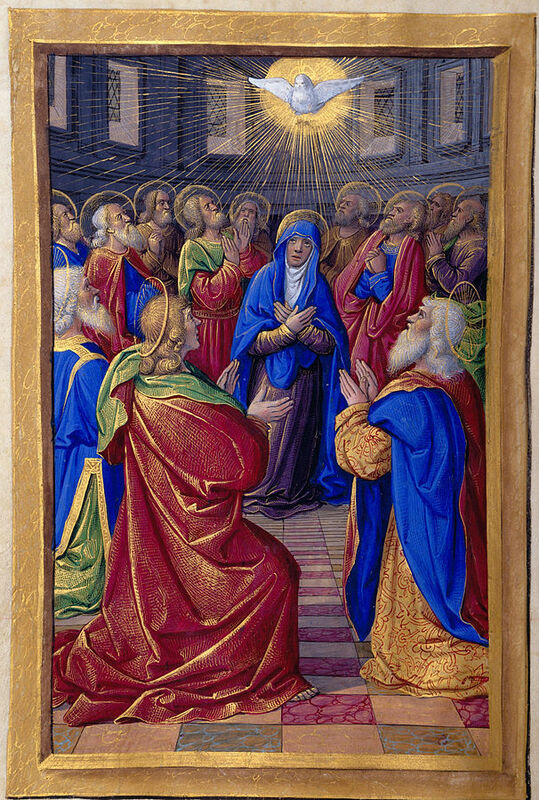 At Pentecost, Christians mark the influence of the Holy Spirit on individual worshipers; the idea of God working through humanity itself; the fundamental difference between the old covenant between God and fallen humanity, and the "New and Everlasting Covenant" between God and the community of believers redeemed by Christ. 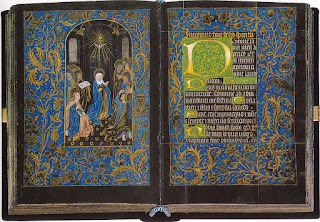 Pentecost, from the Black Hours, Bruges, c 1475, Morgan Library, MS 493 (image is in the Public Domain). "Black Books" were produced by dying the parchment with ink before writing on it: they were both rare and expensive. 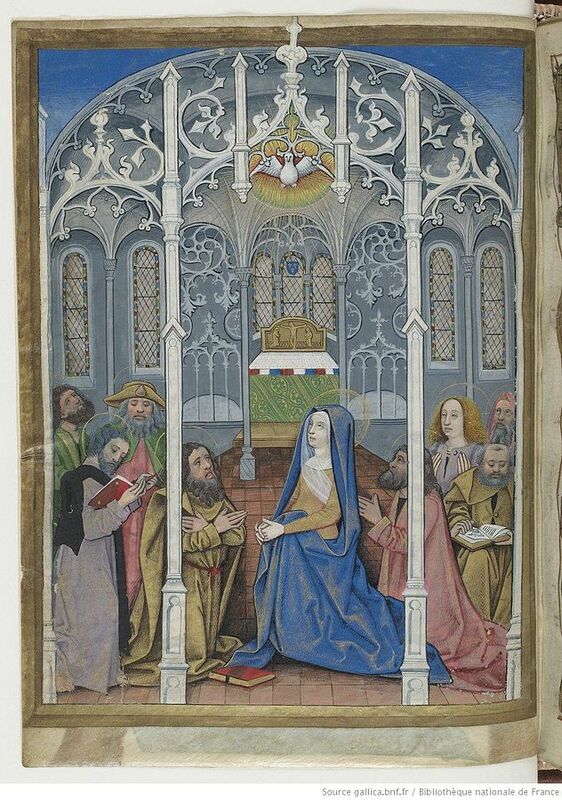 Pentecost, from the Hours of Charles d'Angouleme, late 15th Century, National Library of France, Latin MS 1173. Photo: Cardena2 (licensed under CCA). 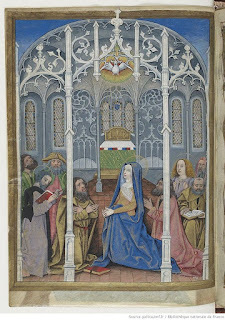 Pentecost, from the Hours of Henry VIII, Morgan Library (image is in the Public Domain). There are good theological reasons why each and every Church festival falls when it does in the calendar, but, looking at the calendar as a whole, it is impossible to avoid the conclusion that it is also constructed with a view to the "labours of the months," the cycle of agricultural work on which Medieval lives depended. After Pentecost, the Church enters "Ordinary Time," in which people can, quite properly, devote most of their time to their duties in the Earthly realm. June meant different things to people in different parts of Medieval Europe, but, as all gardeners know, it is a time at which weeds flourish, and need to be kept under control. 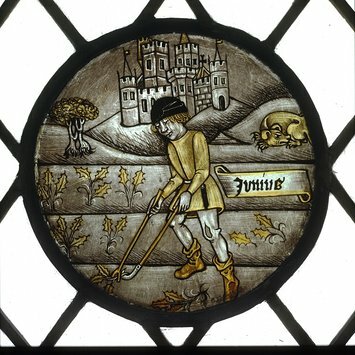 Weeding in June, England, 1450-1475, Victoria & Albert Museum (Non-Commercial License 152334). It was also, in much of northern Europe, a time for the first major harvest of the year, the hay harvest, to be gathered in. Hay was essential as fodder to keep sheep, cattle and horses alive during the winter months, so any significant rainfall at this time of the year would be a major worry for the farmer. Hay was too bulky to transport over long distances, so a failed harvest was a potential disaster. 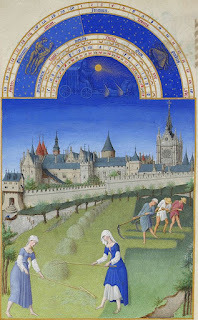 June, from Les Tres Riches Heures du Duc de Berry, Musee Conde (image is in the Public Domain). Hay is harvested in front of the Palais de la Cite and La Sainte Chapelle, Paris. 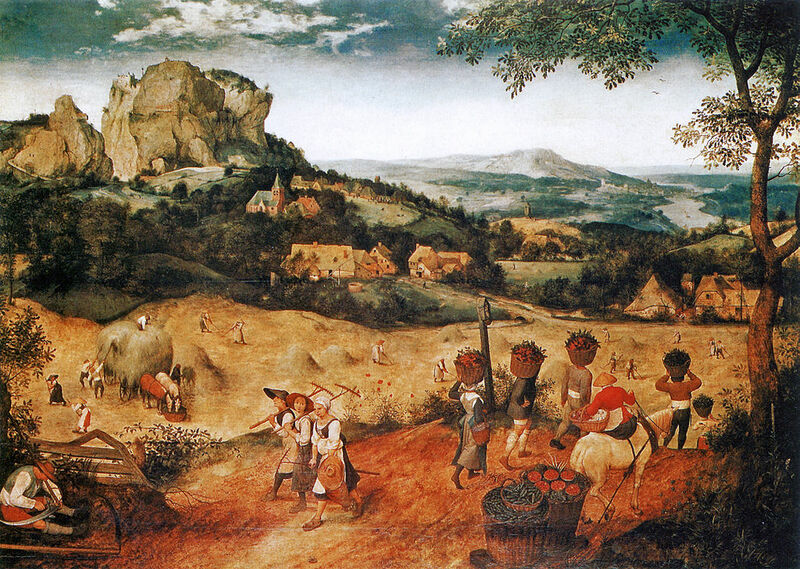 The Hay Harvest, by Pieter Breughel, Lobkowicz Palace, Prague (image is in the Public Domain). For many communities, June was also the season for shearing sheep. Wool was the major source of wealth for many communities in England and Flanders. Even in the tiny hamlet of Montaillou, in the French Pyrenees, whose inhabitants rarely handled money of any sort, people returned from market with coins in return for wool; the men might have been responsible for the shearing, but their wives and daughters often preferred to take the wool to market, keen to ensure that the proceeds were spent on necessities, such as shoe-repairs, and not in the tavern or the brothel. 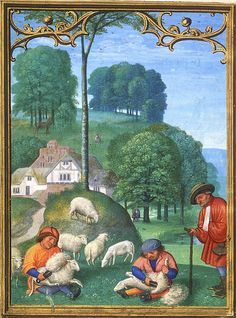 Sheep-shearing in June, from the Da Costa Hours (image is in the Public Domain). 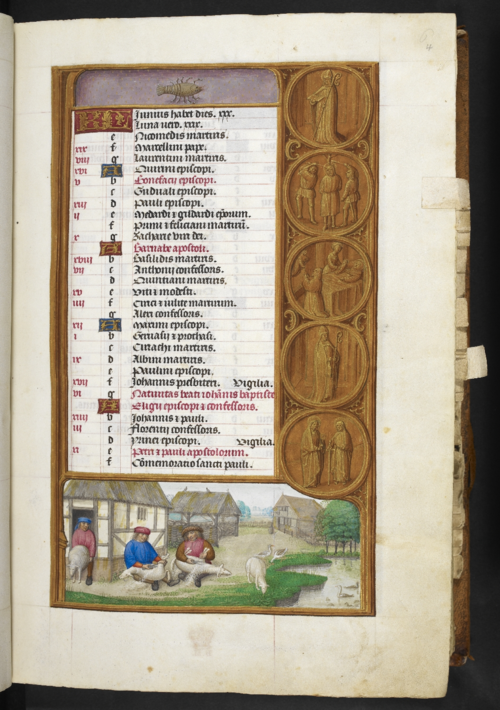 Calendar page for June, from the London Rothschild Hours, Ghent, c 1500, British Library, Add.Ms 35313f004r (image is in the Public Domain). 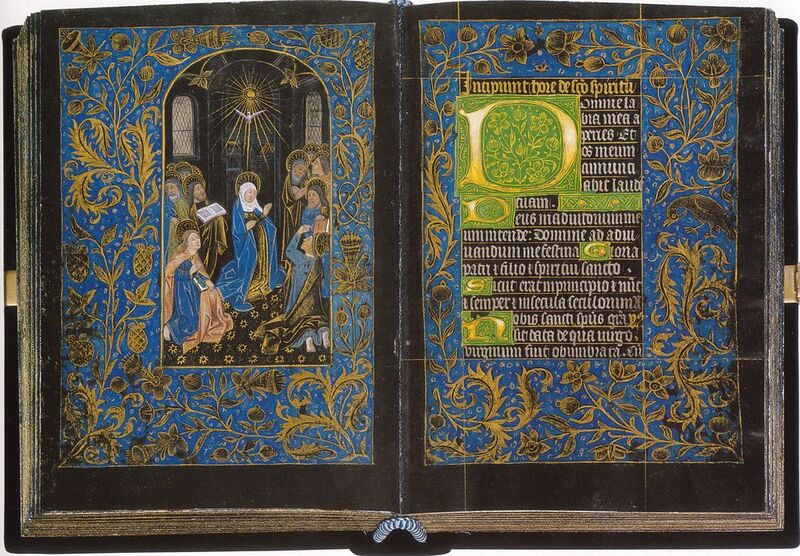 Books of Hours, of course, were for the enjoyment of the leisured classes, whose fields were worked by others. 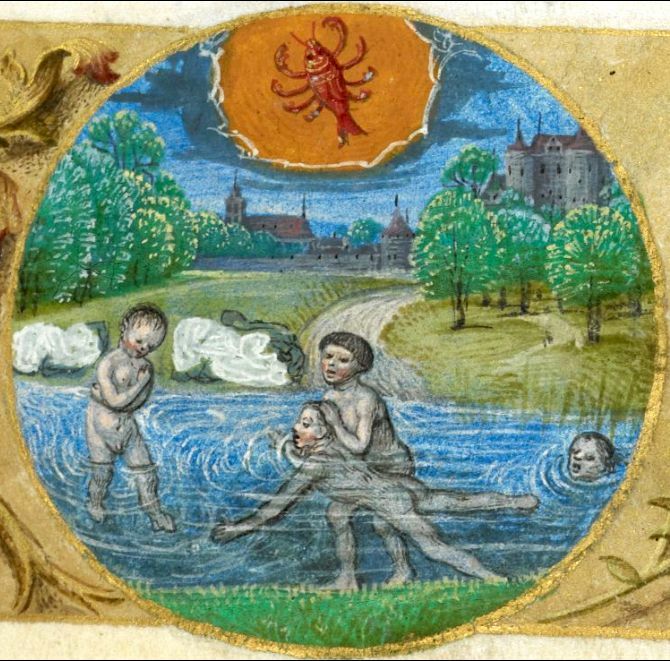 Their own pastimes at this time of the year seem to have included bathing in rivers, and jousting. 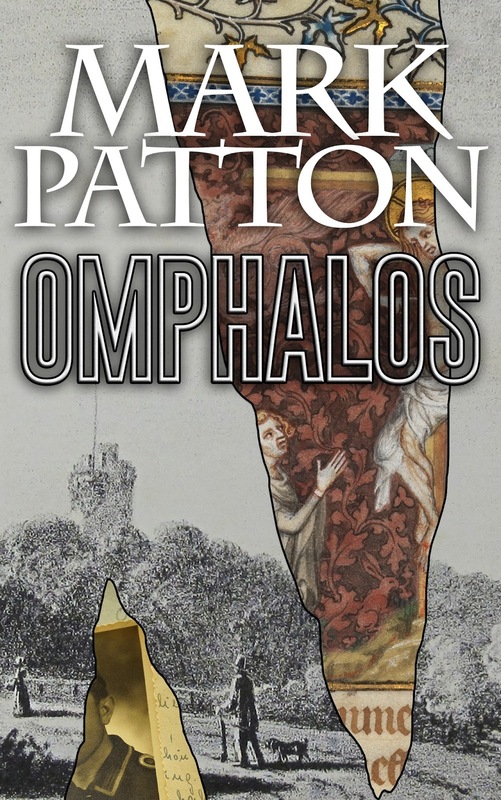 Summer was a season to be enjoyed, but it was all too short, and people of all classes are likely to have had one eye on the harder times that would come around again in due course. 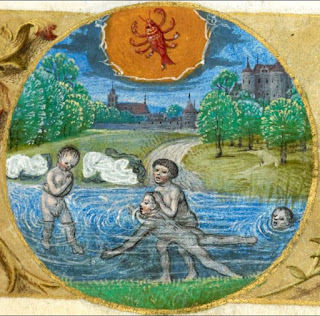 Bathing in a river, c 1485, British Library, Add.Ms 38126 (image is in the Public Domain). 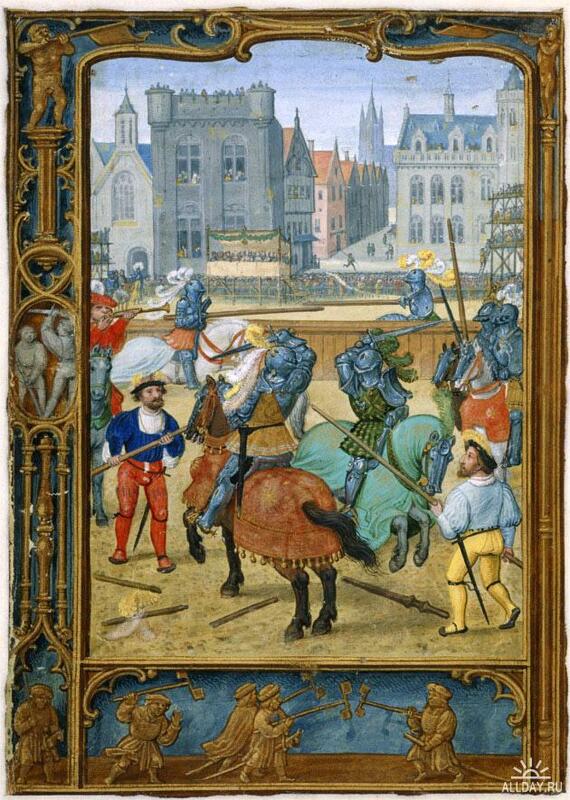 Jousting in June, from the Golf Book (image is in the Public Domain).